In my Race to $1 Million, I have exceptionally mediocre news, and then I have just plain exceptional news. 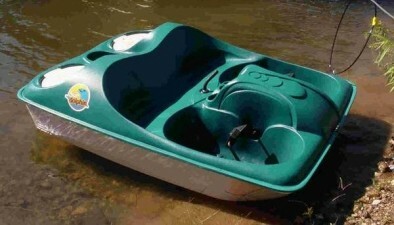 I’ll give the mediocre news first; if I were in a metaphorical boat racing towards $1 million, I’d be in a paddle boat. Without paddles. I’d be trying to propel my metaphorical paddle boat by putting my face in the water and blowing bubbles. Why? My net worth only went up a measly $200 bucks last month. I had two months of $5,000+ gains. At that rate, I was gonna be a millionaire before the end of the world in 2012. Now I’ll be lucky to make it to $1 million before the end of whatever new world replaces this one next year. The reason my net worth was so low is all thanks to the stock market. We had a really bad few weeks and a lot of my options lost quite a bit of value. To be honest, I was lucky I didn’t have a negative month. This is my ride homie! The Hoff lost $6,500! Holy baloney! Maybe he bet on himself in Dancing With The Stars and his bookie finally collected. I don’t really care how it happened, I’m just excited! If you were here two months ago, you might remember that my goal for 2011 was to pull to within $20,000 of The Hoff. Well it’s March and I’m only a few hundred dollars away. This seems like incredible news on the surface, but I’m actually a little scared of it for a few reasons. To be perfectly honest, I’m not happy at all that his net worth went down so much. He’s a good friend and I hate to see that happen. I want to win, but I want it to be because I make tons of money; not because he loses money. I’m hoping for a better March for both of us, although I think I’ll be paying for my vacation next month. It’s probably gonna be a bad one for me. Does anyone wanna give me lots of money? Leave a comment below if you do! St. Paddy’s day is in March, so I predict that pots of gold are in your future! Just follow the rainbow! hahahaha! Ah, so the options aren’t always the way to go. I know very little about them, but it seems when the market is going up everyday, it’s easy to make a bunch of money in a short period of time. Still, if I knew anything about options, I think it will continue to increase over the next 6 months. Will this setback make you rethink your strategy? I don’t think it should. If the stock is going up, the options will typically go up, although that isn’t always the case for out of the money options. I definitely don’t want to change my strategy. I’ve used options to make good amounts of money so far and I’m not going to let a few hundred bucks of a down month scare me off. I’ve had much worse. Well funny you should say that, because my wife and I have been looking for a worthy cause to donate to! So if you promise to clean oil off of a baby seal or hug an orphan, we may have a deal! Anyway, racing towards $1 Million is a lofty goal! What spurred the trip to Costa Rica? We just got back from a honeymoon there… you’ll love it . t financial goals succumb to expensive set-backs! Hope i’m not being too intrusive. Love your blog! Congrats on your marriage and honeymoon. I’m going to learn Spanish and surf. Plus I’ve never been to Central America and I’m excited to go. My job is actually budgeting. Specifically, I help manage and maintain an IT budget at a large corporation. The only thing “anonymous” about this blog is that I don’t disclose where I work, so I can’t say the company, but just know that I’m an IT-Finance combo nerd, which is about as nerdy as it gets. You’re quite the friend and good sport 🙂 if I saw my competition drop so much, I don’t know if I could be so cordial! If he was a random guy I didn’t know personally, I’d probably be happier, but we were roommates at one point and now he’s a guest poster on my blog every Monday. I can’t help but want him to do well.